Ever since Cafe Eclectic opened, Jake has said we needed to go there. Yet I have this complex where I really don't like trying new restaurants so I put off going there. We went once for dessert (when I got a King Leo Peppermint Sundae that was amazing) and looked over the menu. The thing is that at Cafe Eclectic when you look over the menu, nothing jumps out as AMAZING. Well at least not to me. So another six months went by and we didn't return (even though Jake has wanted a N'Awlins Dog ever since that dessert trip). Well luckily for Jake, Elise suggested Cafe Eclectic the other night for dinner. Deciding it was time to check it out, I agreed and off we were. That night I got the homemade mac and cheese with a "cute little salad" and was hooked. The mac and cheese was....oh goodness. Well lets say it was "amazing" and agree that there are no real words to describe it. I love mac and cheese and consider myself to be a mac and cheese critic so for me, this was it. The "cute little salad" turned out to be a DELICIOUS assorted greens salad with the most delectable vinaigrette dressing. See, I have an obsession with Stirling's coffee house in Sewanee because they have a homemade dressing and I crave it. And here I find that right down the street from me is the identical homemade salad dressing. Oh goodness. Anyway back to Cafe Eclectic. It was so good Tuesday night that Elise, Jake and I decided to walk there today. One of the (many) perks of living in Midtown is that there are great neighborhood shops right by. 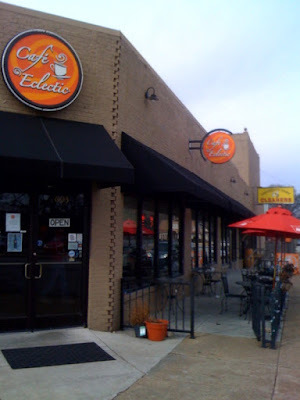 So, with the good weather on our side, we walked over to Cafe Eclectic, our own little neighborhood spot. This time I remembered to take pictures, like a good blogger. It was very crowded and we were surprised to find that they don't serve lunch until 1pm on Saturdays. We waited for a table and kinda sat around at the bar for a minute. Luckily the brunch crowd was clearing out (brunch must be good - there were a lot of people eating it) and we got a table. The service was kind of funky. On Tuesday night we'd had this cute waitress who was super friendly and fast. Today we had an older guy who was very nice but not attentive. We knew what we wanted and set down our menus (the universal sign in restaurant land that you're ready) and yet it took probably another ten minutes for him to come by to get our order. But we're nice so we were cool with it. Plus the food is good so it was worth the wait. The vibe of Cafe Eclectic is chill - modern yet cozy at the same time. There's a coffee bar where you can sit, there is a display case of baked goods (we're going to get some bread soon, I think), and then two rooms of tables. One thing I like is that even though it was full in there, it never seemed crowded or loud. Those things bug me. It was also clean, which is a good thing always. Another cool thing about Cafe Eclectic is that they have fun sodas. 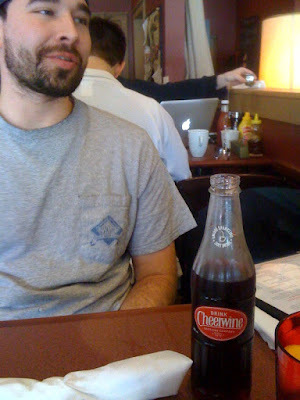 Jake got a Cheerwine. I discovered that they have Mexican Coke. I love some Mexican Coke. See, in other countries they don't put high fructose corn syrup in their cokes. They put real sugar. So for a place to serve Mexican Coke is really exciting because it means I can have a "real" coke. It is $2.00 so I'd have to really want one, but it is bigger than a typical glass bottle coke. After a bit our food came. Jake got his N'Awlins dog (finally - he's waited six months) and I got a grilled cheese. They both came with the "cute little salad" that I love so dearly. I will say that if you choose correctly, lunch can be quite inexpensive there. 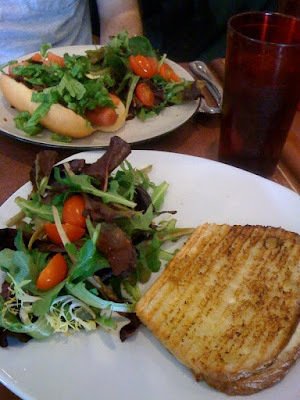 My grilled cheese and salad was about $4 and Jake's dog and salad was $3 I think. Pair that with water and a slight tip and you're out of there pretty comfortably. There are many things on the menu that I need to go back and try (apparently the Chicken Pot Pie is a definite need to try dish) and they usually have a fun soup (Hamburger dill was on the menu one night). 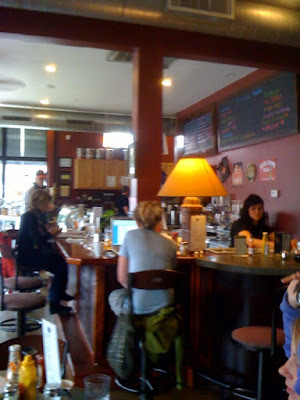 With it two blocks away, I'm sure I'll be hitting up Cafe Eclectic quite often in the future.